My car was purchased by Ford Motor to be a prototype test vehicle in the Stock Vehicle Group. They purchased 10 cars, and records indicate that cars 015, 035, 036, and 049 have not been identified to date and may have been scrapped. My car was assigned the engineering prototype number V818-16. A brass tag with this number was attached to the rocker. In 1968, I was a new engineer and asked for an assignment in the engine calibration and cooling group for Mustang and Fairlane vehicles. They were scrambling to release the 68 1/2 CJ engine calibration and cooling hardware. All Ford products had to pass the acceptance specs. The CJ program was progressing rapidly thanks to the Tasca challenge. Engineering was directed to create a street package that would run 13 sec ETs. The 428CJ had plenty of power, and the final breakthrough came with the traction available with the belted Polyglas tire. High engine oil temps with the high ratio axles was not resolved until the 1969 model year. The win in 1968 at the Winternationals gave the CJ program great recognition, but no one really imagined that our 50 special cars would be so valued someday. Car 032 spent its test days at Ford doing wheel hop, aerodynamic tests and drag work on the test track. During this process, Ford added staggered rear shocks and an automatic trans (tests showed that the autos were quicker). A Cobra Jet exhaust system was added from the H pipe back. The emission hardware was removed. I tagged the vehicle for purchase and luckily Ford resold it as most test cars are scrapped. The resale purchase price was $2508 with 3016 miles on it. My plans were to race it in the C/SA drag class. I ran the car in pure stock with a best of 13.49 secs. I was drafted in 1969, so racing was delayed. Then a wife and two sons and a great 38-year career at Ford engineering put the car on hold. I retired in 2005, and am restoring the car for show. I will do most of the work myself as I have done bodywork for many years. The car is very sound and has 6700 miles on it, but needs paint and some bodywork. 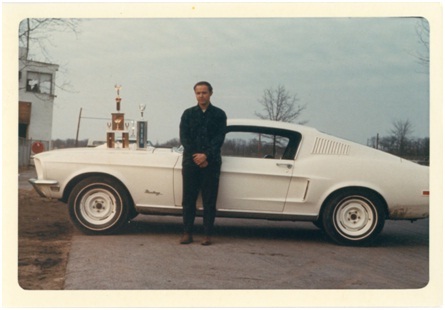 The picture was taken at Milan Dragway in 1969 after winning class and eliminator in pure stock. Uncle Sam had plans for me that delayed any more racing for 2 years.